In 1974, The Zoo Gang was created at a time where World War 2 was fading away in the memories of those who lived through the war and still alive some 30 years later. The premise of the series is this group of reunited ex-resistance/covert fighters, that have gone their separate ways after the war, were then reunited because of a chance encounter with the man that turned in those in the Zoo Gang to the Gestapo. They have come together to reunite for justice for a dead fellow resistance fighter. Four seasoned and talented actors took the roles of the Zoo Gang. Lili Palmer shines as the only female member of the Zoo Gang, her emotional connection to the character displays itself on the screen and demonstrates her prowess over the actresses at that time. Barry Morse and Sir John Mills join the team as obvious englishmen that are clever and sneaky enough to steal cars and pickpocket. 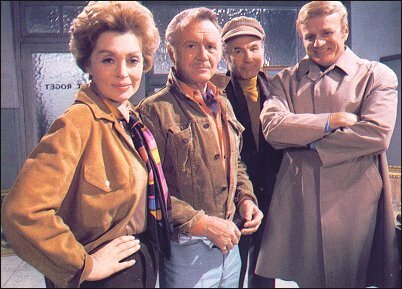 Brian Keith is the token American character, that comes off well as his charm and his deep toned, uniquely accented voice brings in some of the highlights of stereotypically friendly yankee behavior. Brian is the classic John Wayne type cowboy in amongst a pair of Englishmen and a French/German woman, the dynamic couldn’t have been better. The series follows the Zoo Gang as they stick around the area of Nice in the south of France using the reward money that they earn from their investigations to fund a new hospital. It is hard for me to recognise this concept of this show as a realistic one however a leaning towards realism would not have been as entertaining. The show was popular amongst the 50 yr plus audience, the actors were also in this age group. The six episode run of The Zoo Gang was short but was planned due to the full schedules of the cast. As with most ITC shows, the secondary casting is fantastic, filling roles such as russian spies, gypsies, thieves and more which easily spells out quotable and vividly spectacular television. The series likely benefitted from the shortened season despite the momentum upward the shows achieved as the the series ended. Ken Thorne provides an excellent collection of incidental music that could be considered far too hip for this ageing foursome. The addition of a groovy Brass and String soundtrack with hints of the 1970’s coming through supercedes the intro theme song being composed and performed by Paul McCartney while with Wings. As the end of the series came to a conclusion, I sensed in the actors a twinge of disappointment for the series ending and I do agree, the chemistry and the collective raw skill of the cast was addictive to watch. I did however not feel cheated for not having a 25 episode season of The Zoo Gang, just disappointed. A great show definitely worth a watch. An antique dealer is in hot water, his life is in danger but he still holds back on a secret he is privy to. He is the only one with the knowledge of the location of a Nazi treasure that sunk 30 years ago. Now he wants to have the Zoo Gang help him get it out of the wreckage. When the treasure is found, the french customs officers are right there to collect out of the hands of the Zoo Gang. It is suspicious that the Zoo Gang’s whereabouts are known at every step of the investigation. They must find the mole and get back the twisted cross. The final episode of the Zoo Gang strings together a story line that connects with the gangs past. World War II still has lingering shadows that affect the emotions of those who lived through it and revenge is still on peoples minds. This story follows a ruby brooch made by the nazis for Eva Braun. On land and sea this episode is full of excitement and danger , fitting for the last episode of a good series. A shipment being pick up along side the beach ends in a murder and the Zoo Gang have a large suitcase of cash. This could only end in tears as a counterfeit money gang tighten their grip. Manouche finds a suspicious bill at Judge Gautier’s house but this doesn’t mean the case is getting warm. The Counterfeit Trap displays more reasons for why acting can change a story. Albeit the storyline is complex and timely develops into a drama filled episode. There are some great moving shots, for instance as Brian Keith is taken down into a boat and the camera sweeps through the hull. I enjoyed this episode for its locations and great story. A revolutionary fighter is captured at the airport for having a false passport. The authorities did not want El Leon captured but now cannot release him legally. The Zoo Gang is hired to break El Leon out of jail but it appears to be a setup. Someone else wants El Leon. The Lion Hunt plays out like the typical kidnapping scenario you would see throughout the ITC shows produced. Roger Delgado plays the revolutionary Pedro and does a splendid job acting in this episode. I enjoyed the show for the acting as I have throughout the series but also I am beginning to appreciate the concept of the show as well. A good episode. An art collection of an exiled African General is stolen which was to be used for a charity auction. The Zoo Gang have connections that could help the General find the thieves. Narrowing down their search, the gang finds a twist to these robberies that spark their curiosity. The General still needs the auction to take place to help his countrymen by in Africa. It becomes clear that the auction was not the priority and that the money would be used for other unknown reasons. In this episode, is the adventure of an art heist with a pool dipping African general. The story is thinly veiled but fun to watch. Kieron Moore , an ITC regular, adds to the already amazing cast. There is a play on stereotypes with the gun smuggling african general but I believe the characters, particularly the General’s, are strong and demand respect. A great episode.